Telling the truth about God without excluding anyone is a challenge to the Quaker community. Drawing on the author's academic research into Quaker uses of religious language and her teaching to Quaker and academic groups, Rhiannon Grant aims to make accessible some key theological and philosophical insights. She explains that Quakers might sound vague but are actually making clear and creative theological claims. Theology isn't just for wordy people or intellectuals, it's for everyone. And that's important because our religious language is related to, not separate from, our religious experience. It also becomes clear that denying other people's claims often leads to making your own and that even apparently negative positions can also be making positive statements. How do Quakers tell the truth about God? This book explores this key theological process through fourteen short chapters. As Quakers, we say that we know some things, but not very much, about God, and that we are in a constant process of trying to improve our ways of saying what we do know. 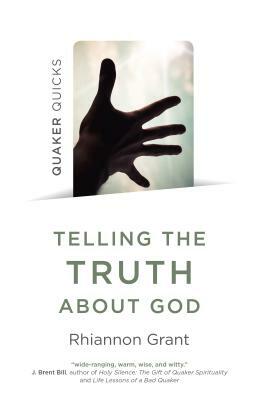 Quaker Quicks - Telling the Truth about God: Quaker Approaches to Theology by Grant, Rhiannon was published by Christian Alternative in April 2019 and is our 57344th best seller. The ISBN for Quaker Quicks - Telling the Truth about God: Quaker Approaches to Theology is 9781789040814. Be the first to review Quaker Quicks - Telling the Truth about God: Quaker Approaches to Theology! Got a question? No problem! Just click here to ask us about Quaker Quicks - Telling the Truth about God: Quaker Approaches to Theology.